For one day a year, the waves crash the shore without carrying surfers. The music pulsating from the beach clubs is gone. There are no motorbikes whizzing by carrying entire families. Even the airport is quiet, with no flights coming in or going out. It’s hard to believe, but in one of the most popular tourist destinations in the world, there’s a day of complete silence. Nyepi is the Balinese New Year, and it’s celebrated in a day of silence meant for reflection, meditation, and fasting. In the lead-up to the holiday, though, there’s lots going on. Get a guide to Bali’s day of silence in the video and a little recap below. Damn those ogoh-ogoh are freaky! Nyepi is the most important holiday on the Island of the Gods, and preparations start weeks in advance. In towns and villages all over the island, you’ll see groups of young men working on building their ogoh-ogoh statues. These terrifying, demon-like creatures are made of paper mache and feature bulging eyes, sharp fangs, and long claws. It’s a lot of work putting together the ogoh-ogoh, and it’s definitely a point of pride for each banjar (the traditional town council). 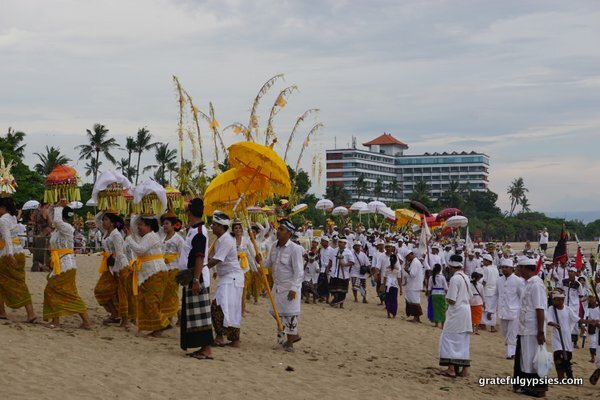 Melasti ceremony on the beach in Sanur. Before the ogoh-ogoh can be paraded through the streets, there are plenty of ceremonies to attend to. One of the most important is the Melasti ceremony. Statues of the gods are removed from temples and brought to the sea to be washed and purified. It’s the one day out of the year where places like Double Six beach in Seminyak will be completely taken over by a local ceremony and all businesses are shut down. Traditionally, the ogoh-ogoh are walked through the town and then ceremoniously burned. 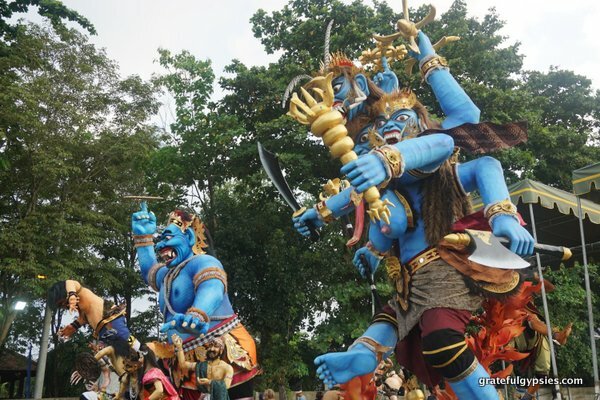 This symbolically rids Bali of evil spirits before the New Year. Due to the massive traffic jams and pollution this causes, some places have chosen to do things a bit differently. The collection of banjar that make up the Sanur area decided to have a massive competition instead. 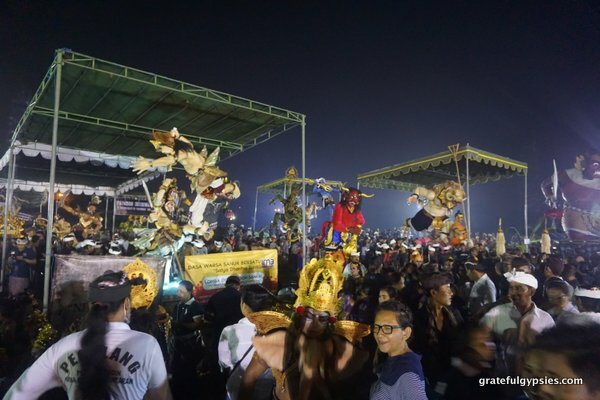 Thousands gathered to watch each banjar give a short performance introducing their ogoh-ogoh. Rather than burn them afterwards, some decided to proudly display their hideous creature for several weeks more. I guess they’re not so worried about those evil spirits. Not a bad place to be stuck. While many tourists make it a point to avoid being in Bali around the time of Nyepi by jetting off to the Gili Islands, it’s well worth sticking around for. Take part in the festivities and then enjoy a day of silence. In our hyper-connected world, it’s nice to slow down for a day and reflect. Celebrating local festivals is one of the best parts about traveling and should be embraced, not avoided. Experiencing Nyepi was one of the highlights of our (almost) year on the island and we’d highly recommend it. This year, the Day of Silence falls on March 28th, with the ogoh-ogoh festival taking place the night before. 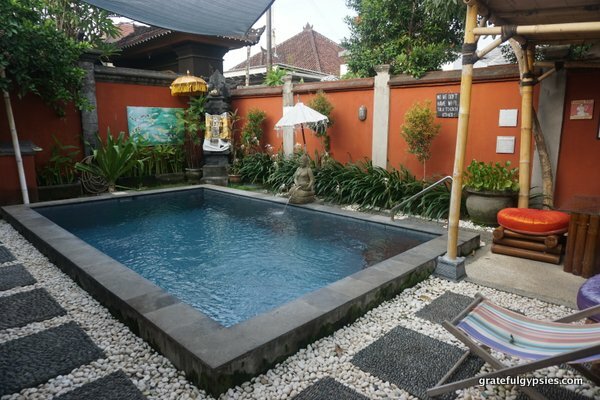 Want to stay in Bali semi-long term like we did? Be sure to read our guide about how to do just that! Thanks for your call and your message after Jerry passed! It was wonderful to hear your voice. I wanted to call you but Danny said I needed ‘two more numbers’ to dial before dialing the number left on my phone…Can you help me with that??? Also, I want to wish you a belated birthday!! Please tell me if this is the way that I contact you or do you have a personal email address?? I am not tech smart ! !